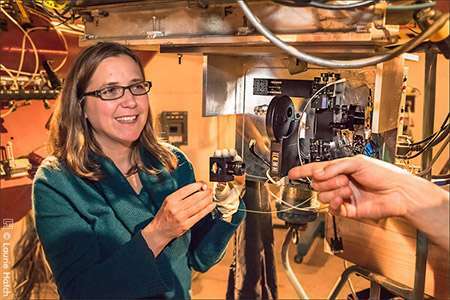 "Infrared light would be an excellent means of interstellar communication," said Shelley Wright, an Assistant Professor of Physics at the University of California, San Diego who led the development of the new instrument while at the University of Toronto's Dunlap Institute for Astronomy & Astrophysics. "We had to wait," Wright said, for technology to catch up. "I spent eight years waiting and watching as new technology emerged." Three years ago while at the Dunlap Institute, Wright purchased newly available detectors and tested them to see if they worked well enough to deploy to a telescope. She found that they did. Jérome Maire, a Fellow at the Dunlap, "turned the screws," Wright said, playing a key role in the hands-on effort to develop the new instrument, called NIROSETI for near-infrared optical SETI. 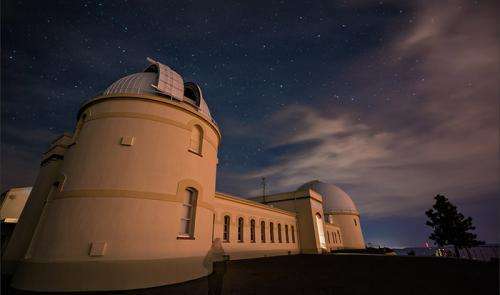 NIROSETI has been installed at the University of California's Lick Observatory on Mt. Hamilton east of San Jose and saw first light on March 15. Lick Observatory has been the site of several previous SETI searches including an instrument to look in the optical realm, which Wright built as an undergraduate student at UC Santa Cruz under the direction of Remington Stone, the director of operations at Lick at that time. Dan Werthimer and Richard Treffers of UC Berkeley designed that first optical instrument. All three are playing critical roles in the new search. NIROSETI could uncover new information about the physical universe as well. "This is the first time Earthlings have looked at the universe at infrared wavelengths with nanosecond time scales," Werthimer said. "The instrument could discover new astrophysical phenomena, or perhaps answer the question of whether we are alone." Drake pointed out several additional advantages to a search in this new realm. "The signals are so strong that we only need a small telescope to receive them. Smaller telescopes can offer more observational time, and that is good because we need to search many stars for a chance of success." he said. The receivers are also much more affordable that those used on radio telescopes. "There is only one downside: the extraterrestrials would need to be transmitting their signals in our direction," Drake said, though he sees a positive side to that limitation. "If we get a signal from someone who's aiming for us, it could mean there's altruism in the universe. I like that idea. If they want to be friendly, that's who we will find." We continue to go about this all wrong. We have the misunderstanding that we do things right according to the laws of the universe and nature, when a little critical thinking will show just how wrong we are. We assume that any higher life form would go about things the same way that we have as far as inventions and communications, not to mention transportation, and energy. Our biggest misstep is not understanding, though critical thinking, how our historical records of events and occurrences have been corrupted and altered due to greed for power, profit, and control. There is plenty of evidence that when examined through an open mind and a disconnection with our current "belief" system, shows just haw far back the level of corruption exists. The story of Eduard Albert Meier is the most important story of scientific and historical significance to never be told. Check out theyflydotcom. Hey, here's a thought, could supercomputers like "Watson", "HAL", "Cray" using the "Drake Equation" calculation be programmed to, if not predict, a more precise mathematical probability and likelihood that extra-terrestrial intelligent life exists and where it most likely would be and the best places to look? Hmmm? Hey, here's a thought, could supercomputers like "Watson", "HAL", "Cray" using the "Drake Equation" calculation and the secrets, discoveries, etc., some folks don't tell us, be programmed to, if not predict, a more precise mathematical probability and likelihood that extra-terrestrial intelligent life exists and where it most likely would be and the best places to look? Hmmm? @plejarenrrite Do you have evidence that ET would be different? just asking. Search for extraterrestrial intelligence extends methods to make money without big eforts. Usually the hunters of nonexistent do not drink water sweaty. We've either been visited by extraterrestrial intelligence, or the men charged with safe-guarding our nuclear weapons are hallucinating. Strange happenings at top-secret military bases are not repeatable under controlled laboratory conditions, however, so scientists must search for extraterrestrial intelligence "under the street-light." Patient souls, those scientists!